This is an adventurous album from Mary Chapin Carpenter. Using a large orchestra and cinema soundtrack arranger Vince Mendoza, she performs some of her songs, which are given an often sweeping cinematic backing. Her voice is a quiet one, it is certainly not one that dominates, so thankfully the music is rarely slowed to overpower her. The idea is that it enhances the songs, making them seem as if they were intended for cinematic use. For me, I'm not sure if it works. It is a different project to 2018's re-singing of some of her songs many years later, this is a deliberate attempt to enhance the songs with some cinematic music. I love the songs and will always love them, but this just doesn't quite do it for me, which is highly unusual, because I would normally still love it if I heard Mary Chapin Carpenter gargling mouthwash. It certainly suits the beautiful "Between Here And Gone" and "Ideas Are Like Stars" where the backing just sounds dramatic and beautiful. "The Dreaming Road" is also given a real cinematic gravitas but, unfortunately, the lovely "I Am A Town" has all is quiet soul and cadence ripped out of it by a deafening, crashing melodramatic backing. 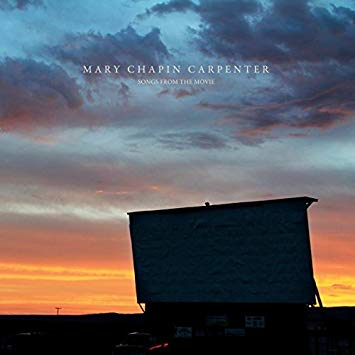 Personally I feel the appeal of Mary Chapin Carpenter's songs lie in their essential quietness, particularly those she has selected on here. Their sensitive tenderness and MCC's often sensual, wise, whispered voice just doesn't need those massive sweeping strings, as if someone is riding over the top of a ridge or a hero is passionately kissing his girl, or we are seeing an aerial shot of the Grand Canyon. I feel her songs are best served by single strings, or a tinkling piano, a gentle moving violin. Their previously understated backing was their strength. The first movements of the beautiful "Only A Dream" sees them get it just right and the booming orchestral swell that greets the "twirl me around" line is one of the times that it justifies it. I think this one works. I still prefer the original, though, as I do on all of them. "Come On Come On" has a fetching percussion sound, but again I feel the big cinematic production takes away the sparse beauty that gave the song its appeal in the first place. "Mrs Hemingway" works perfectly, however, because the song is so filmic and evocative in its imagery and the backing on here is considerably subtler. This is one of my favourite cuts on the album. "Goodnight America" is just a beautiful song, whatever the arrangement and here, again the orchestration does it proud. As I said, I prefer the originals, and while I admire the experiment, and enjoyed some of them, I prefer my MCC at home, not at the movies.